Two barriers to settlement of the near empty, muddy, swampy site called Chicago were removed between 1825 and 1833. This removal caused a trickle of settlers to turn into an unstoppable torrent of humanity within a decade. The development of Chicago would mirror what had already happened on the east coast after. People came from Europe and settled the first area they found on the Atlantic coast, children were born and grew up. Then they looked for land. Go west, became the watchword. But mountains, swamps, and the indigenous peoples who already occupied the land were challenges to the westward movement. Two factors made it difficult for Americans east of Chicago to make the trip. First, the Indian population showed their objections to white settlers moving into their land by frequent raids. Second, no direct land or water route to Chicago existed. But these impediments were not to stand. First, the US government made a two-pronged policy to discourage the Indian population from remaining in the area: soldiers were sent to raid the villages and treaties were made with promises of land west of the Mississippi. By the early 1830s, most of the Potowatami people were forced out. With the IndianRemoval Act of 1833, one barrier to new settlement of the Chicago area was now gone. The next barrier to fall was the geographic difficulties facing those who wanted to settle in the area. Americans coming from New England, New York and New Jersey had no roads to travel overland to Chicago. They had to rely on water transportation, but there was not a direct unbroken route. Finally in 1825, the Erie Canal made it possible for travelers to come by boat from the East Coast to Chicago via the Great Lakes. This new route to Chicago brought in many settlers although an additional canal and other improvements would be necessary to really open up the way. Kruz and Allison [Public domain], via Wikimedia Commons. And what caused this change in the Chicago economy from reliance on the fur trade? The emergence of farming and the concurrent deluge of new settlers from the Atlantic states (New York, New Jersey, Pennsylvania, Maryland and Virginia) combined with a multitude of entrepreneurs eager to take advantage of Chicago’s geographic advantages brought a new vitality and money to Chicago. Change was in the air in the village of Chicago. A land grab of huge proportions was just beginning. 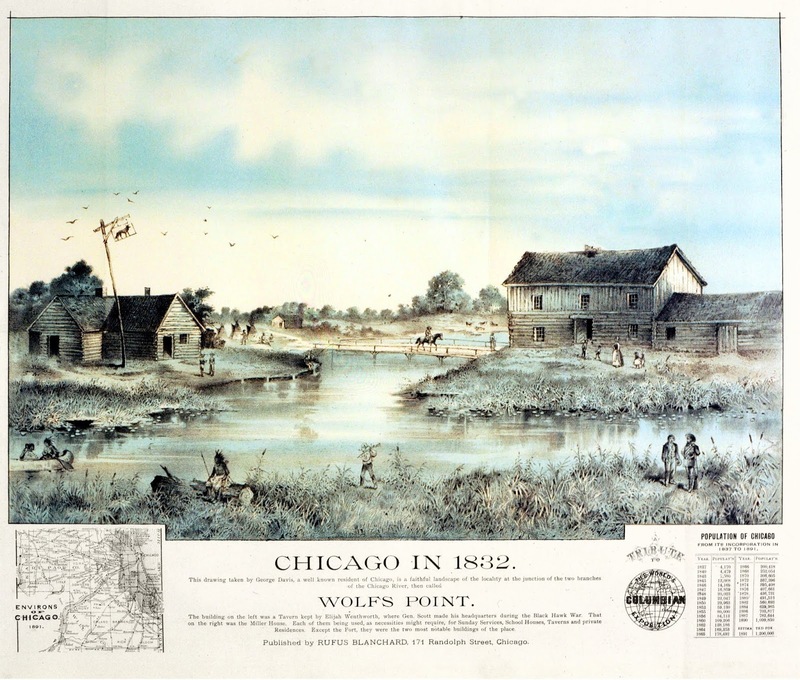 Enterprising persons with a view to the future saw the possibilities of the geographic position of Chicago both as a trading hub and a gateway to the west. There was money to be made! Speculators began buying up lots. Joining the fur traders and those who furnished them with lodging, liquor and supplies, surveyors, lawyers and speculators arrived to assist in mapping and selling land to eager buyers. More grocery stores opened and new clothing and building materials stores sprang up to serve the growing population. As stated above, the increase in population correlated with a change in the ethnicity of the people of Chicago. Let’s look at some records to chart the changes in the ethnic make-up of this area from the 1820s to the 1830s. 1 Métis, The Electronic Encyclopedia of Chicago, Chicago Historical Society, The Newberry Library, < http://www.encyclopedia.chicagohistory.org/pages/818.html>, downloaded 12 Dec 2018. 2 Fremont O. Bennett, compiled, Politics and Politicians of Chicago: Cook County, and Illinois. Memorial Volume, 1787-1887. A Complete Record of Municipal, County, State and National Politics from the Earliest Period to the Present Time. And an Account of the Haymarket Massacre of May 4, 1886, and the Anarchist Trials, (Chicago, IL, The Blakely Printing Company, 1886), p. 14. 3Bessie Louise Pierce, A History of Chicago The beginning of a City 1673-1848, Vol 1, (Chicago, IL, The University of Chicago Press, 1937), p. 32. 4 Joseph Garraghan Gilbert, The Catholic Church in Chicago, 1673-1871: An Historical Sketch, (Chicago, IL, Loyola University Press, 1921), pgs. 45-46. 6 Joseph Kirkland, The Story of Chicago, Vol. 1, (Chicago, IL, Dibble Publishing Company, 1892), p. 152. 7 Bennett, Politics and Politicians of Chicago: Cook County, and Illinois. Memorial Volume, 1787-1887. A Complete Record of Municipal, County, State and National Politics from the Earliest Period to the Present Time. And an Account of the Haymarket Massacre of May 4, 1886, and the Anarchist Trials, p. 16. To get an idea of how Chicago began, we need to understand the settlement of the North American continent and how the area we know as our great city fits into this history. 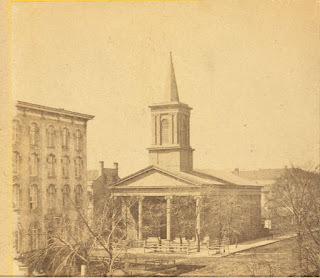 Gallatin, Albert, and American Antiquarian Society. aboutA.D. along the Atlantic, & about 1800 A.D. The Library of Congress, <www.loc.gov/item/2002622260/>. As noted above, the indigenous peoples were in the Chicago area using the portage as part of an extensive trading system in about 5,400BC, long before and Europeans were aware of this continent. The French arrived in the “New World” in the early sixteenth century. In my post of June 17, 2017, I wrote about the fur trade in North America and how it influenced Chicago. In this post, I mentioned the French practice of intermarrying with the Native American population. This practice had a great influence on the population of early nineteenth century Chicago. The English came to North America early in the seventeenth century and soon established a fur trading empire on the Atlantic Coast of what is now Canada. The French fur trade operated in the interior of Canada and down to the Great Lakes and even areas south. But it wasn’t long before tensions between the two countries in Europe over land erupted in North America; both countries wanted its riches and to claim to it as their own. 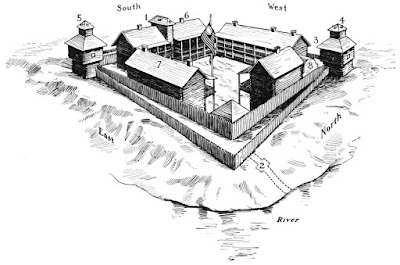 Both colonial powers began building forts to “protect” their areas of interest in the upper Ohio River valley, claimed by both countries in the early to mid 1700s. Isolated skirmishes broke out and a full-fledged war began in 1754 which ended in an English victory. From that time on, the French influence in the North American fur trade diminished. However, the French practice of intermarriage with their native trading partner communities produced a major impact on subsequent generations in this area of the US and Canada, including the Illinois territory. The children of these unions were some of the earliest settlers of Chicago as we will see in our next post. So now we come to the early eighteenth century in the Chicago area. What has happened to the fur trade since the English defeated the French in 1754? “English and Scottish merchants, now settled in Montreal, took over control of the fur trade and allied themselves with the remaining French traders.”2 But the new country of America wanted to extend its territory and get in on the lucrative fur trade. Many far sighted American leaders recognized the potential of the Chicago portage. At this time there was no actual community in the territory of Chicago. But this was about to change as the nineteenth century dawned. The US government established the first permanent settlement, Fort Dearborn, in 1803 as a foothold in this area. Another reason for the building of Fort Dearborn was the presence of the Native Americans, mainly members of the Potowatami tribe. The American attitude toward the land on this continent was that all of it was open to settlement without regard to any earlier inhabitants. In these early days of the seventeenth century, the number of settlers was small due to the difficult swampy and muddy terrain around Chicago which made it almost inaccessible much of the year. But advances in transportation, including planned canals, promised to open the flood gates to more American pioneers. The US government was looking ahead and this posed problems for the original peoples who had long occupied this land. Before long, tensions erupted and skirmishes broke out that culminated in 1812 with the Potowatamis burning Fort Dearborn. This attack was the beginning of the end for the tribes living in this area. President Andrew Jackson signed the Indian Removal Act in 1830 which legalized the driving of Indians to reservations west of the Mississippi. A steady stream of settlers would soon be coming to start building a village out of the mud. In an early Chicago history from 1912, Josiah Seymour Currey mentions James Carney as one of the earliest Irish settlers in the muddy, swampy area that was to become Chicago. He joined with other intrepid and enterprising people (including Native Americans, French Canadians, the offspring of the unions between French and Native Americans, and Americans from other established cities and towns) to build a village that would become a great metropolis in a few decades. James Carney is listed in the Robert Fergus’ Chicago Directory, 1830 as having a “grocery and provision store, 133 Lake Street.” p. 9 A Patrick Timoney is listed as a laborer, boarding with James Carney. p. 33. As mentioned in a previous post, this James Carney was a merchant, grocer, and finally a brewer in the 1830s-1850s in Chicago. He belonged to a stellar group of early businessmen who laid the economic foundations for the young city. But who was this Irish Chicagoan? Where did he come from in Ireland? Or did he come from Northern Ireland? On the map below, Northern Ireland is at the top right and the rest of the country is Ireland. Where did he learn the trading, marketing, operating, brewing skills that brought him such success in Chicago? With whom did he associate in Chicago? This became my challenge – learning as much as I could about James’ life in Chicago from available records and maybe getting some clues as to where in Ireland James Carney was born and lived until his emigration to America. In a later post I will explore possible connections between James and John Carney, my great great grandfather. If you have done any research on your Irish American ancestors, you have probably faced this obstacle: a minimal number of records both here and across the Atlantic. If you’re lucky, you might have a family bible, oral histories, photos, or maybe an heirloom or two. In my case I had none of the above about James Carney. Despite the scarcity of official records, the fact that James participated in local politics and joined in some social groups earned him a mention or two in some local histories of Chicago. Let’s start there. James Carney was an early Irish immigrant and successful merchant who recognized that participation in local politics could be an entry into acceptance as an “American.” In 1840 he ran for alderman of Chicago’s second ward and was elected as noted on p. 102 in M.L. Ahern’s Political History of Chicago: 1837-1887. In addition to his work as a businessman and his political service, James also showed a passion for the independence of his birth country. In the 1844 Chicago City Directory, reprinted in 1902 by Ellis and Fergus, he is listed as the treasurer for The Chicago Repeal Association. This group’s mission, as was of the original group in Ireland, was to advocate for the repeal of the 1800 Acts of Union that joined England and Ireland into United Kingdom of Great Britain. James was also active in the intellectual life of his Catholic parish of Old St. Mary’s. 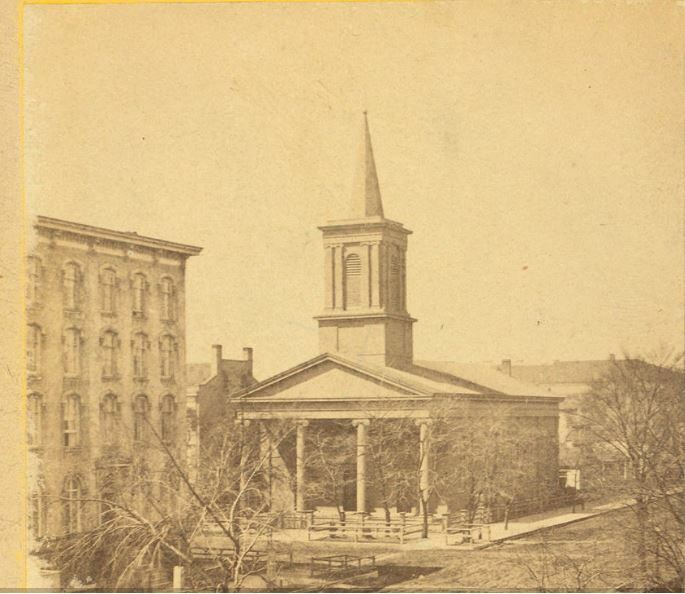 The photo below is the third structure of the church which was built on Madison and Wabash in 1842. St. Mary's Cathedral of Chicago, from Robert N.
The 1844 City Directory lists him as the treasurer of the Catholic Library Society (p. 68) I could find no information about this society after a google search and an inquiry to the Archdiocese ofChicago. But the name of the society, the fact that it met in the basement of Old St. Mary’s Church, and the time of its existence (1840s) provide some clues. At this time in Chicago’s early history, public libraries were non-existent. It wasn’t until after the Great Fire of1871 that a public library system was created. Religious, civic-minded businessmen with an interest in both local, national and world affairs would require a comfortable and private place to read/discuss both Catholic and secular newspapers, magazines, and books. We now have some knowledge of James Carney’s business, civic, and social footprint in early Chicago, but where did he come from in Ireland? To begin to answer this question, we need to re-visit that research technique called “cluster genealogy” that I discussed in my blog post Immigrants to America tended to travel from the old country in groups of people known to each other. This historical phenomenon is known as "network migration." (p. 83-84.) Once in America, they lived near the same people and others from their country of origin. Since we don’t know where James Carney lived in Ireland, maybe we can find out some answers from the people he lived with, worked with, and worshiped with. Who were James Carney’s associates? The 1850 Chicago, Cook, IL federal census provides a detailed look at James Carney’s household; we see who worked for him in the brewery and lived in his household: Patrick Timoney, Daniel McElroy, John O’Neill and Mary McGillen. But how long had these families been in community? Let's start with US records. 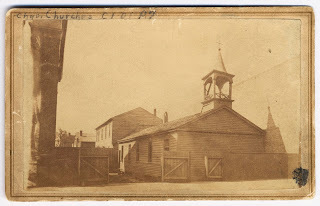 The earliest documents in Chicago of James Carney and allied families are in the marriage records from Old St. Mary’s Catholic Church in its second structure at Michigan and Madison. “Edward McGillen…came to Chicago (from Ireland) in the early 1830s when he was only eight years old. He was brought here by a grand uncle, James Carney, who was a merchant and traded with the Indians in Fort Dearborn days of Chicago history.” p. 712. A geographic anchoring for Edward McGillen comes from a death certificate for his son, John McGillen, dated 01 March 1924 in Chicago, IL., stating that he was born in Fermanagh County, Northern Ireland. Thus we have established a family foothold in Ulster for James Carney’s grandnephew, our first placing of a cohort across the ocean. The aforementioned researcher also shared with me that some of her McGillen ancestors lived in Leitrim County, Ireland in the townland of Kiltyclogher near the Fermanagh border. In the 1911 Ireland Census, a Bessie McGillen, age 74, is listed as mother of Patrick McGillen, age 39. Bessie’s birthdate puts the family in County Leitrim prior to 1837. What about the rest of the cohort families: McElroy, O’Neill, and Timoney? Did they originally hail from Northern Ireland, around Fermanagh near Leitrim or Tyrone? Dr. Tyrone Bowes has created a tool that was just right for me to use to begin my search. He made a geographical distribution of surnames in Ireland/Northern Ireland and plotted them on a map, and it is available for purchase on the website. To spread out this large map and see the names of your target families jump out at you is truly an awesome experience. Three names (McCarney, McElroy, and O’Neill) appear in the Northern Irish county of Tyrone (bordering on Fermanagh to the north) and the name Timoney is shown just across the northwestern border of Fermanagh with County Donegal. With this information from Bowes site to orient me, I moved on to Griffith’s Valuation which is like a census in that it recorded where people lived and what property they owned in mid-nineteenth century Ireland. This record is arranged according to the levels of administrative units in Ireland/Northern Ireland: townland (village,) civil parish, religious parish, Poor Law Union (based on neighboring townlands around a central market town,) barony, and county. A civil parish often included more than one barony or county. The website Ask About Ireland provides free access to those who want to search Griffith’s Valuation. Where to begin my search in the database? I thought the best place would be the important clue we have: County Leitrim, near Kiltyclogher by the Fermanagh border, where the McGillens once lived. From here we might see if any of the families were in nearby Fermanagh also. When we look name distribution in County Leitrim near Kiltyclogher and the Fermanagh border, we see an interesting picture. Members of the Carney family are found in two townlands in Leitrim County in the barony of Drumhaire. The first townland is Manorhamilton, in the Civil Parish of Cloonclare, which is 7 miles from the second townland of Cashel, in the Civil Parish of Killanummery. Members of the three of the four associated families all lived in the same barony between 5-9 miles of one of these townlands. One family lived in the barony of Roscloger which is only 6 miles from Manorhamilton. This can be shown more clearly on the map below. When we turn to the locations of Carney and associated families in County Fermanagh, we also find an intriguing picture. Carney family members settled in the townlands of Culky and Laragh, about five miles from the large market townland of Enniskillen. The other families all lived within 8-13 miles of Culky. As can be seen on the map below, Enniskillen is about 15 miles from the County Leitrim border. The results of my search were no surprise; members of the five different families were scattered in, around and between the townlands of Kiltyclogher (County Leitrim, bordering Fermanagh) and Enniskillen in County Fermanagh near the Leitrim border. To find out where in Ireland/Northern Ireland James Carney was born and lived before his emigration to America. I am very happy with how far I have come in my effort to find the homeplace of James Carney and his associated families in Northern Ireland. I have used Irish records to show that the five families did indeed live near each other in Northern Ireland along both sides of the border of County Leitrim near Kiltyclogher and up to Enniskillen in County Fermanagh. However, more research is needed to try to identify more exactly the Carney townland/village. In a subsequent post, I will explore the possible connections between James Carney and my great great grandfather, John Carney.